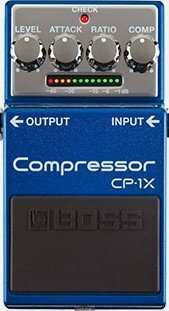 Powered by BOSS’s MDP technology, the CP-1X is a new type of multiband compressor for guitar that preserves the character of your instrument and technique for unlimited musical expression. Intelligent processing analyzes your signal in multiple dimensions as you play, providing advanced dynamics control that never colors or muddies your tone like typical stompbox compressors can. The simple, four-knob interface makes it easy to dial in sophisticated results, while the handy gain reduction indicator always shows you how much compression is being applied. Optimized for all types of guitars, the CP-1X offers next-generation performance for every style of music.